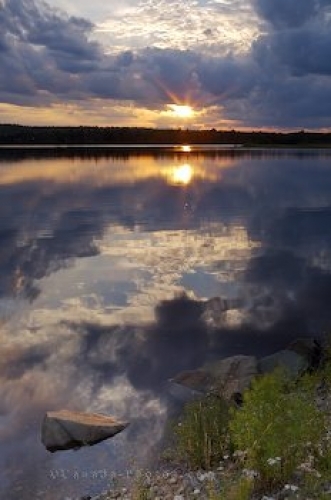 While camping at the St Mary's Riverside Campground in Sherbrooke, Nova Scotia, a sunset creates a mirror image of the clouds over the surface of the St Mary's River. The clouds look just as billowy on the water as the do throughout the sky with the last remaining light at sunset twinkling across the river. Sunset over the St Mary's River seen from the St Mary's Riverside Campground in the town of Sherbrooke along the Marine Drive, Highway 7, Nova Scotia, Canada. Picture of a sunset over the St Mary's River in Sherbrooke, Nova Scotia in Canada.